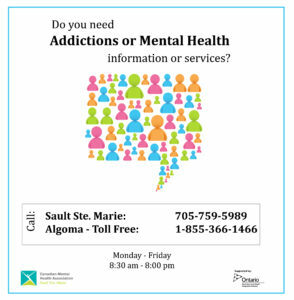 The Canadian Mental Health Association – Sault Ste. Marie is a proud partner of Change Day Ontario. Change Day Ontario is part of a growing global movement that empowers individuals and teams to make small actions to collectively bring positive change to the health system. The movement runs for a few months and culminates in a day of celebration on November 17th, 2017. Join us and make a pledge, big or small, to improve compassionate quality care and inspire positive change within the health system. Learn more and make pledges at changedayontario.ca from September 12th to November 17th. Download the Change Day Ontario poster by clicking the download link below.